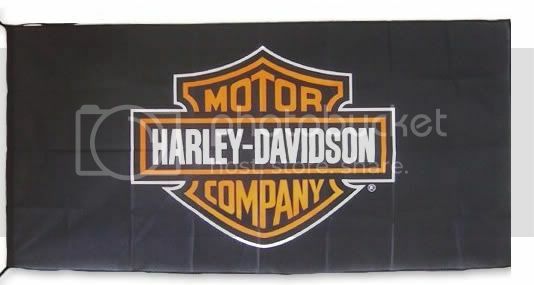 In the video at https://www.youtube.com/watch?v=rkO0KVRgJeo (at 3:40), you can see the flag of the Harley-Davidson corporation. 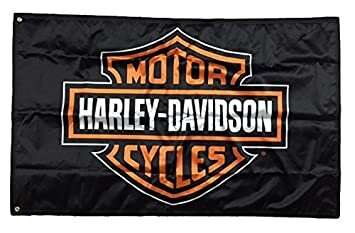 The flag is a horizontal black flag with the logo (known as "Bar & Shield", first used in 1910) (https://en.wikipedia.org/wiki/Harley-Davidson#/media/File:Harley-Davidson.svg) in he middle. Harley-Davidson, Inc. (H-D), or Harley, is an American motorcycle manufacturer, founded in Milwaukee, Wisconsin in 1903. 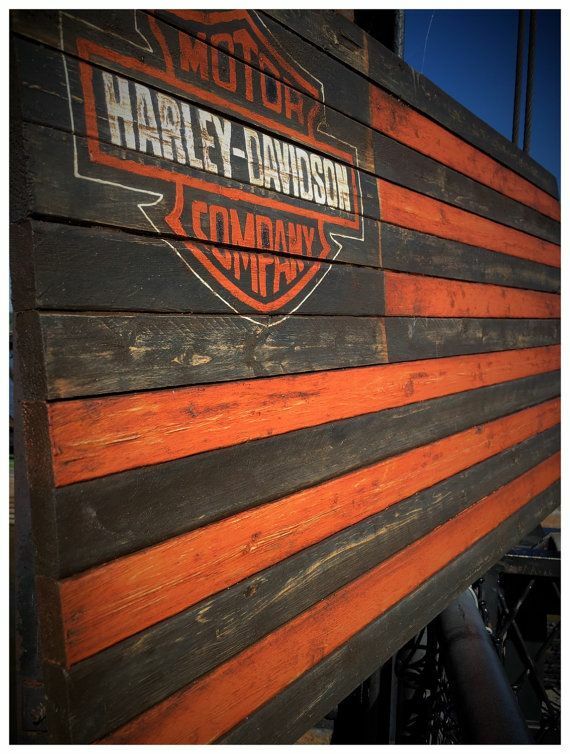 It derives its name from two of its founders, William S. Harley and Arthur Davidson. Sources: http://www.harley-davidson.com/content/h-d/en_US/home/museum/explore/hd-history.html, http://www.harley-davidson.com/content/h-d/en_US/home/museum/explore/hd-timeline.html and https://en.wikipedia.org/wiki/Harley-Davidson. portray supposedly existing flags on the Museum itself. 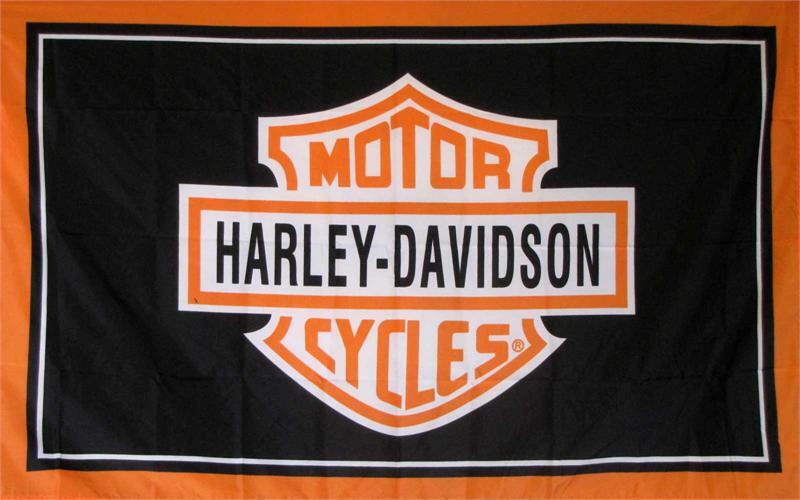 The logo is interesting, showing an ultra-stylized/simplified shield (bearing the word "motor-cycles" split in two, above and below) with a rectangular sign on it across, reading "Harley-Davidson". This seems to be a very old logo, barely modified since it's creation in the early 20th century. This is usually painted using the colors black, orange, and white. This variant lacks the white outline. The white area on this one is much thinner, leaving (unlike in the official flag) a few sharp concavities. 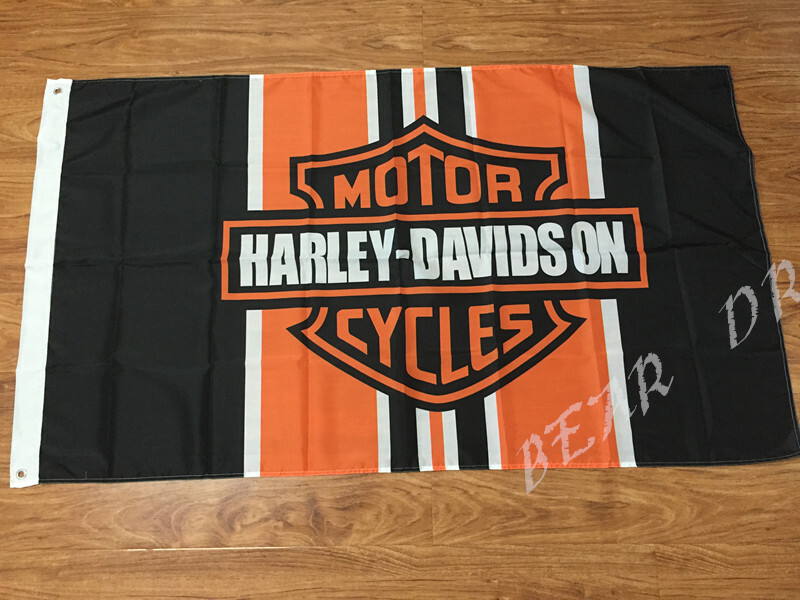 This one has the logo with the black and white elements swapped and an additional border all around the flag: thick orange outside and a thin white orle (leaving a black gap) inside. This one has the logo just like on the (supposedly) official flag with an additional border all around: thick orange outside and a thin white orle (leaving a black gap) inside. Logo as in the (seemingly) official flag on a background that’s mainly black with three vertical orange stripes, with white fimbriations, the middle stripe much thinner than the other two. 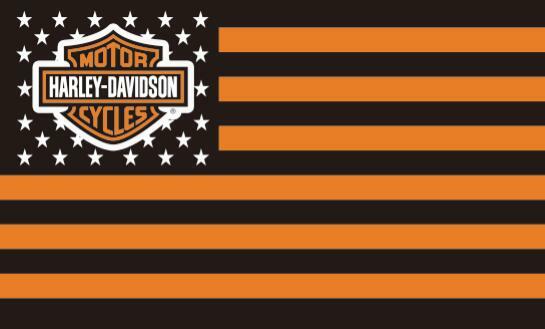 Modified U.S. national flag with white stars on black canton and black and orange stripes. I could not find examples of other possible replacement permutations, but they may exist. Modified U.S. national flag [us.html] with black and orange stripes and on a plain black canton the company logo over all.